Sargent was born February 10, 1908 in Cincinnati to Sargent Morris Willis and Beatrice Ennis. He grew up with his mother’s family and attended Madisonville Public School. His Uncle Ed Ennis was a Cincinnati Fireman and possibly influenced his final career choice. Sargent worked as a mechanic’s helper, clerk, and telephone operator. On May 16, 1928 he joined the Cincinnati Police Department and was assigned to District 5. By April 1930, he was living at 4123 Fergus Avenue with his wife, son, step-father, and mother. On April 22, 1930, Detectives Philip Vorherr and Fred Stagenhorst discovered a 50-gallon moonshine still concealed in a 12-foot-square cavern which had been dug into the side of a hill on John Miller’s farm at Faraday Road near Baltimore Pike. District Five officers, Sergeant Leo Hereth and Patrolmen Willis, Joseph Cunningham, Frank Bergman, and Homer Moreland were called to the scene. They seized eight barrels of mash and 60 gallons of liquor as evidence. John Miller, of RR9, was arrested at his home and charged with possession and manufacturing of liquor and possession of a still. The uniformed officers set their attention to disassembling the still. Sergeant Hereth and Patrolman Willis were furthest into the cavern and Patrolmen Cunningham and Bergman were next to them when the still exploded. It is believed that the officers tore away a piece of a connection on a gas pipe which fed the stove used to heat the mash and that a lantern hanging in the cave ignited the fumes from the escaping gas. The explosion showered some of the officers with boiling liquid and ignited Sergeant Hereth’s and Patrolman Willis’s clothing. Detectives Vorherr and Stagenhorst were in the field adjoining the cavern when the explosion occurred, and they immediately went to the aid of their fellow officers. Five officers were transported to General Hospital. Patrolman Cunningham and Bergman suffered from burns and Moreland from smoke inhalation. Sergeant Hereth was burned on the face and arms and in serious condition. Patrolman Willis sustained burns on his head, face, and body from the waist up and was in grave condition. Patrolman Willis passed away the next day, April 23, 1930. He was survived by his 21-year-old wife, Marie (Pyle) Willis; both parents; and son, Sargent M. Willis III (1½). He was buried in Spring Grove Cemetery on April 25, 1930, at 2:45 p.m., three days before his 3rd wedding anniversary and two weeks before his 2nd anniversary with the Police Division. Sergeant Hereth was eventually released from General Hospital and returned to work after a 47-day absence. Patrolmen Cunningham lost 23 days. The other patrolmen were lesser injured. Mrs. and Sargent Willis III returned to Fayetteville to live with her family. We have no information on whether Miller was convicted and/or imprisoned. State statutes banning alcohol were passed in our region prior to the Prohibition Amendment of the U.S. Constitution and generally repealed before the repeal of the Amendment. During the twelve years that alcohol was banned, 40 law enforcement officers in Greater Cincinnati lost their lives; almost three times more per year than during non-Prohibition years. © This narrative was revised on April 19, 2015 by Cincinnati Police Lieutenant Stephen R. Kramer (Retired), Greater Cincinnati Police Historical Society President, including research product provided by Cincinnati Police Dispatcher Karen Arbogast (Retired), Greater Cincinnati Police Museum Researcher. 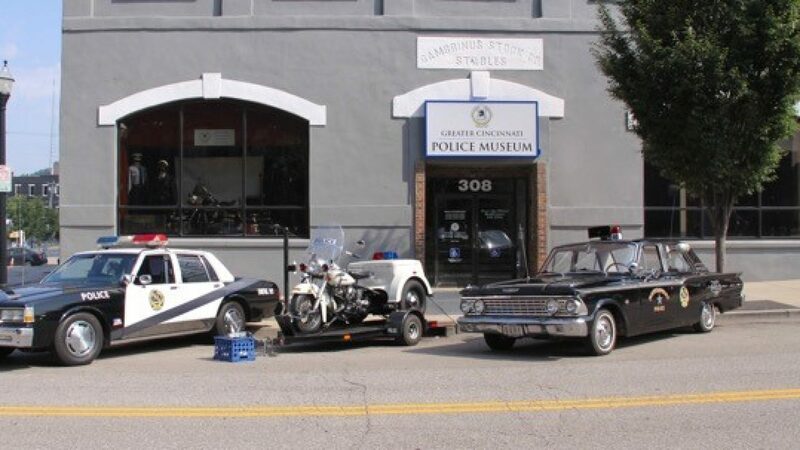 All rights are reserved to them and the Greater Cincinnati Police Museum.